Malbork castle tour - Polish Tours & Travel Agency - Greetings from Poland! Visit to the biggest brick castle in Eastern Europe built in 13th century in the vicinity of Gdansk (60 km). This gothic castle, with a system of defensive walls, towers, a labyrinth of chambers, dungeons and architectural details, was the headquarters of the order of the Teutonic Knights. Unconquerable stronghold of 50-acre area was one of the largest fortresses of medieval Europe. 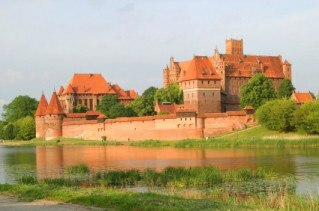 Price includes: transfer by car / bus Gdansk- Malbork -Gdansk, Malbork castle tour with foreign language speaking guide, entrance tickets. Additional info: tour organized on request.